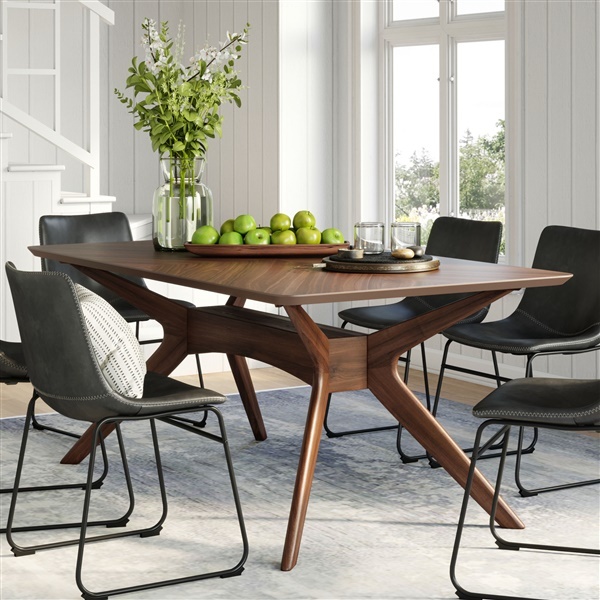 The Sigrid Rectangular Dining Table makes for a striking centerpiece in your dining space. Its Scandinavian inspired base is expertly accented by a wood veneered top that showcases an elegantly intersecting wood-grain pattern. Ideal for larger spaces, the Sigrid Rectangular Dining Table is crafted from solid Oak and is available in both natural and walnut finishes. Comfortably sits up to 6 guests. Ordering in white oak, very happy with my choice! Table was accurate to the photos, exactly what I wanted! Beautiful grain on the wood, plenty of surface area on the top and roomy enough around so no one is bumping elbows, the design looks good in my dining room too! A finely crafted dining table with a lot of character in the leg design - it is exceptionally attractive with the look of my dining room and I was happy with how fast it arrived! Pretty much everything I was looking for in a dining table! The design, the color, the size! Perfection! Impressive design, perfect size for my family, we all love the way the legs look too! thanks! remarkable design! delighted with my order! Totally thrilled with my new table! It is absolutely beautiful, thank you! Wonderful design. Well-crafted. Sophisticated. Very happy with my purchase! This table is absolutely stunning. It exceeded my expectations in every way. The finish and the pattern are beautiful. I have gotten so many compliments. ProsBuilt very well, gorgeous pattern, great size.